A video revolution is coming – and it'll revolutionize stills photography as well as filmmaking. Get ready for 33 megapixel grabs! It's been called everything from 'super hi-vision' and 'hyperrealism to 'perfect reality' and 'immersive TV', but what actually is 8K? Touted recently by TV makers, already sometimes used by Hollywood to film the latest blockbusters, and now appearing on some high-end 360 virtual reality camera set-ups, 8K is creeping on to consumer products. Currently, the best 4K cameras are still limited to 3840 x 2160 UHD resolution (some go slightly higher with Cinema 4K modes), so 8K video is a whole new ballpark. YouTube and Vimeo both support 8K video, and in Japan there's even a satellite broadcaster offering an 8K TV channel in advance of the Tokyo 2020 Olympics, which will be shown live in 8K across Japan by its state broadcaster. It's early days for 8K, and for now, most people are happy with 4K, but momentum is building – and imagers need to be ready. Created in the early years of this century by Japan's state broadcaster NHK (when it was called Super Hi-Vision), 8Kis a technology that’s been waiting its turn for a long time. 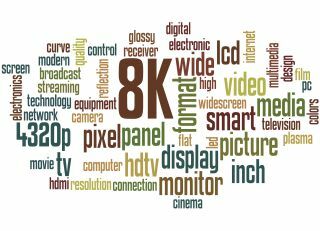 It got its name from meaning anything with a width of 8,000 pixels, though recent international broadcast standards now define 8K resolution as meaning exactly 7680x4320 pixels. That means an image that’s about four times bigger than 4K. Though initially it was only possible to view 8K video using a rack of two aligned 4K projectors, 8K TVs are now available from some mainstream brands. Sharp's 70-inch LC-70X500E and Samsung's 75-inch Q900R, which cost £6,999 and £6,799 respectively, are on sale now, while LG's 88-inch OLED88Z9PUA will go on sale very soon. You can already buy Dell’s 32-inch UltraSharp UP3218K LCD monitor for just north of £3,000. How much better is 8K than current video/TV? Technically speaking, 8K is four times better than 4K, and 16 times better than full HD, but a better way for photographers to understand 8K is in terms of megapixels. While a 4K image, which is defined as 3840x2160 pixels, equates to a 8.29 megapixel image, 8K creates a 33.17 megapixel image. NHK insist that 22.2 channel surround sound is part of the 8K format, too, though none of the early 8K products include anything like that. Put 8K in pure megapixel terms and your perception of 8K should instantly change. Is 8K a pointlessly futuristic technology? Or one that’s inevitable, and much-needed for filmmakers, TV producers, videographers and photographers to better capture and convey reality? Make no mistake about it; 8K is big, big news for photographers and videographers. Will I notice a difference? Yes, because 8K is about pixel density. For video, it's quite a jump. From a viewer's perspective, to get the same pixel density as a 32-inch Full HD TV you would need a 120-inch 8K TV or PC monitor. However, it's how close you sit to an 8K TV that determines whether you see the extra detail or not. In short, the closer you sit, the more detail you see, as shown by this viewing distance calculator. If you get a chance to see an 8K TV in action, perhaps in a flagship electronics store, go right up to the screen and see if you can make out the pixel grid in the panel itself. Closely examine an 8K panel, then do the same with a 4K panel, and then ask yourself this: can you foresee an Apple 8K Retina iMac not being a hit with photographers? What are the advantages of 8K? Consumer-grade cameras capable of shooting 8K video are not expected to go on sale for several years. However, it's going to change some key photography techniques. For instance, wildlife photographers regularly employ a hit-and-miss ‘machine-gun’ technique when they spot their target animal, taking as many frames per second as they possibly can. Ditto sports photographers. Since still images from an 8K video are 33 megapixels, it will become possible just film the animal, or the athlete, 8K and grab a high-resolution still frame later. That already happens in some so-called ‘4K cameras’, so it’s probably an inevitable evolution for all kinds of cameras. For the broadcast TV industry, 8K production will be an upgrade on the same 'over-capture' versatility that 4K has brought. For the last few years sports broadcasters have been filming with 4K cameras purely to enhance their HD channels. For example, directors can zoom in on 4K footage by up to 4x without losing any resolution for a HD broadcast, creating their own close-ups and essentially saving money on using a dedicated close-up camera. This kind of reframing and zooming into images will only increase with the advent of 8K, especially when 4K broadcasts properly kick-off. When will 8K cameras come? They're already here. In time there will be 8K action cameras, 8K dashcams, and even DSLR and mirrorless cameras that have 8K video capabilities – and indulge in 8K grabs and over-capture to extend editing possibilities – but where 8K is expected to have the biggest impact is with virtual reality (VR) and 360° video. As a mainstream format, VR hasn't really taken off yet, and many blame VR headsets' lack of resolution. VR is probably only going to convince when the wearer of a headset becomes completely unaware of the panel’s pixel structure, and that's something only 8K (and even higher resolutions) will bring. So hungry are VR gamers for more resolution that it’s likely that real-time 8K multiplayer VR gaming will drive the adoption of 8K as a new video format. However, that will only happen once 5G networks are common. There are already some 360° video cameras around that create 8K resolution video, including the Insta360 360 Pro 8K VR camera. 8K TVs will need to show 120 frames-per-second, which for now, they do not. What are the disadvantages of 8K? Although 8K products are beginning to go on sale, it's far from a finished format. One of the main issues is frame rate, which is expressed as frames per second (fps). That describes how many still images are flashed up on the screen per second. The higher the number, the smoother the video will look. The latest generation of high-end 4K action cameras and 360° cameras can capture up to 60fps. For now, that is the limit for 4K, and if you want to film slick-looking high-octane or slow-motion sequences at higher frame rates, you have to drop the resolution down to full HD quality or lower. So what about 8K? For now, 8K TVs can only manage 60fps, and many think that for the format to truly impress on motion sharpness, it will have to jump to 120fps. After all, a blurry high resolution image makes the extra detail invisible. However, 8K 120fps takes a huge amount more processing power than 4K, and that is going to put a lot of pressure on production, network and storage infrastructures for broadcasters. Another challenge is bandwidth, which will require new kinds of compression formats; file sizes will have to be drastically reduced while retaining their pixel depth. Are you excited about 8K? You should be. It's going to change the way we compose, edit and re-package photos and video, and it could massively boost VR video. There's still a lot of work to be done behind-the-scenes to make 8K a reality, particularly as a practical broadcast TV standard. However, 4K TV broadcasts are still in their infancy, and 8K TV sales are not expected to become significant for at least another three or four years, so the entire industry has plenty of time to adjust to 8K and its massive bandwidth requirements. Either way, the race for more and more megapixels is far from over. What is 5G? And what does it mean for photographers?